In fact, F.B.I. agents sent an informant to talk to two campaign advisers only after they received evidence that the pair had suspicious contacts linked to Russia during the campaign. The informant, an American academic who teaches in Britain, made contact late that summer with one campaign adviser, George Papadopoulos, according to people familiar with the matter. He also met repeatedly in the ensuing months with the other aide, Carter Page, who was also under F.B.I. scrutiny for his ties to Russia. The role of the informant is at the heart of the newest battle between top law enforcement officials and Mr. Trumps congressional allies over the F.B.I.s most politically charged investigations in decades. The lawmakers, who say they are concerned that federal investigators are abusing their authority, have demanded documents from the Justice Department about the informant. Law enforcement officials have refused, saying that handing over the documents would imperil both the sources anonymity and safety. The New York Times has learned the sources identity but typically does not name informants to preserve their safety. You can tell the article is crap when it takes three reporters to write it. The whispers of espionage and double bluffs have reportedly been enough to make three experts resign from their positions as conveners of the academic forum - with many more arguing over the alleged links. Revolution and sedition within the federal government! We have 90% of the FBI, the DOJ and a big part of the other federal bureaucracies in open revolt and sedition against the President of the USA! And hardly a peep about any of it from Attorney General Jeff Sessions! The funny part is with the full might of the federal government behind her, Hillary still lost. Thats called Distinction Without a Difference. The NYT editors evidently didnt learn logical fallacies. Translation: FBI Used Informant to find Dirt on Trump, found nothing, are now busy inventing other excuses after the fact and Trump was right all along. I guess it comes down again to what the meaning of is is again. 1. They ran a story on January 20, 2017 about the FBI using wiretaps in their investigation of the stupid "Russia collusion" narrative. 2. 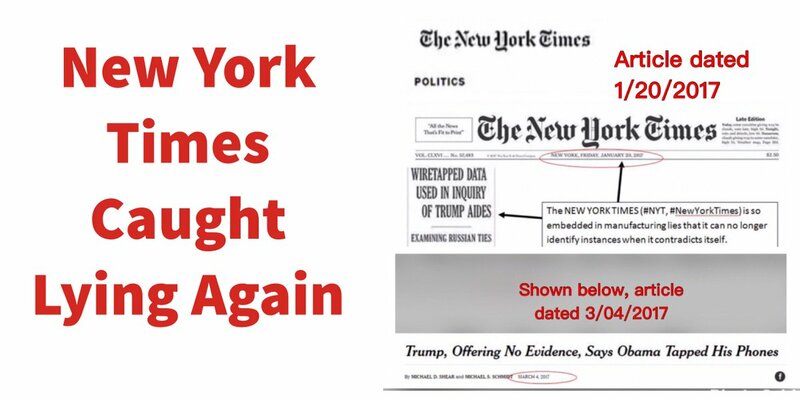 After Trump accused the Obama administration of "wire tapping" him in early March, the NYT ran a story on March 4, 2017 claiming that Trump had no evidence for this accusation. 3. What this graphic doesn't show you is that at least one NYT reporter (Michael Schmidt) is listed on BOTH stories. "All the news that fit to print?" LMAO. The NYT staff demonstrates clearly right here that they themselves believe its own news shouldn't even be considered accurate. If that is so, then why the Mueller investigation? And why didn't they inform Trump about what they were doing? "F.B.I. Used Informant to Investigate Russia Ties to Campaign, Not to Spy"
Like when the USSR used Julius and Ethel Rosenberg to "investigate" the US development of the atomic bomb. Bonnie and Clyde auditing bank security. If this unnamed person didn’t tell Carter and Papadopolis who he was working for, then he was spying on them. A person who spies is a spy. The FBI leaders abused their power in doing this and if the justice system weren’t so sick, they would all end up in prison for it. I know you already know that. Did the FBI also send an informant to Hilliarys campaign?